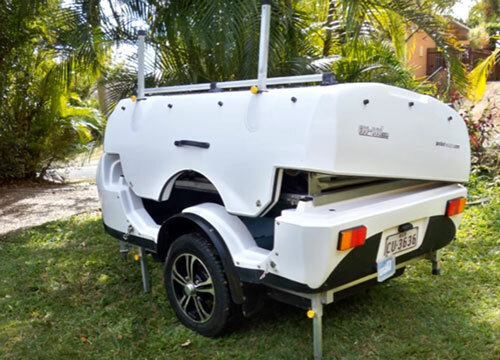 Evo-Pod mini-camper was designed in Australia back in 2007 for towing by motorcycles, ATVs and small cars. It’s an interesting concept although today, after almost 10 years since its design took shape there is still surprisingly very little information on the net. Did it survive the test of time? 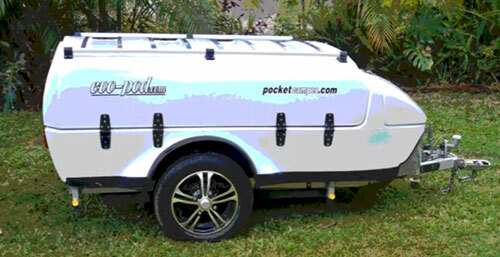 Whatever happened to this pocket-camper (as it is known “down there in Australia”), the designs seems so innovative that I decided to make this short presentation to “spread the news”. The camper has two main sections – spacious storage under the bed and the bed itself. 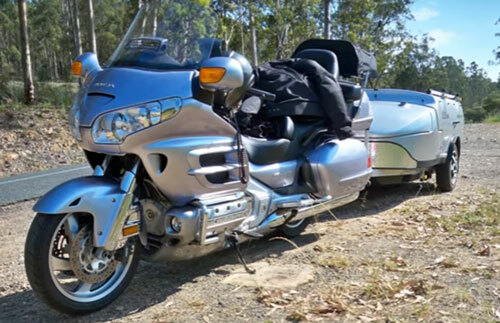 The storage has jaw dropping capacity of 1.7 cubic meter (60 cubic feet) – almost unimaginable in this class of campers. And the best is that there is “permanent” access to the storage space regardless the camper’s configuration (open or folded). The front bin is so large that apparently it can keep 40 liters cooler (about 10.5 gallons). 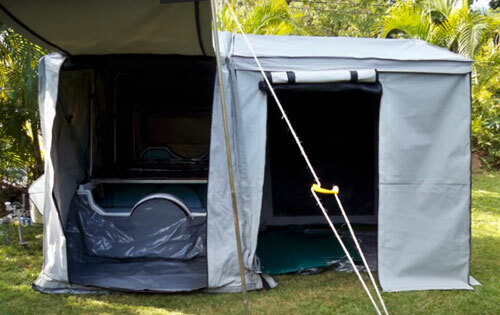 The tent (including the bed section and the dressing room) unfolds when the camper lid is opened and flipped 180 degrees on the side (tent’s orientation is perpendicular to the trailer’s tongue). The lid rests on two supports some 10-12 inches above the ground level (supports are individually adjustable to accommodate the environment). The set-up process seems to be a bit complex and may take good few minutes to finish (actually longer if the mattress is inflatable what seems to be the case). 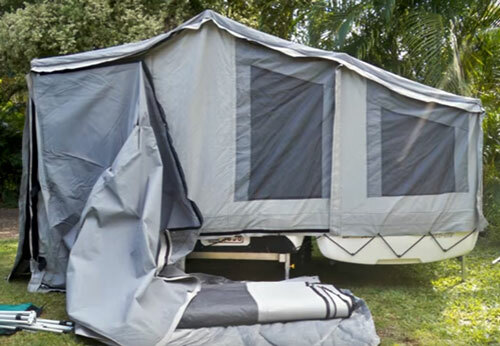 Also, based on available videos, the mattress has to be removed when the tent is pulled-down, so by the same token it has to be later placed back on the bed together with sheets. The dressing room’s height allows for free movement inside. The floor and side panel covering the trailer’s wheel) are attached by Velcro and easily removable. To get on the bed you may have to step into the trailer’s storage box (bed’s platform only partially overlaps the trailer’s box). It is a kind of “molded-fiberglass step” facilitating the access to/from the bed given the fact that the latter is located relatively high above the ground. The optional Add-a-Room can add a lot of extra living space converting the Evo-Pod camper to kind of “Little-Big Camper”. 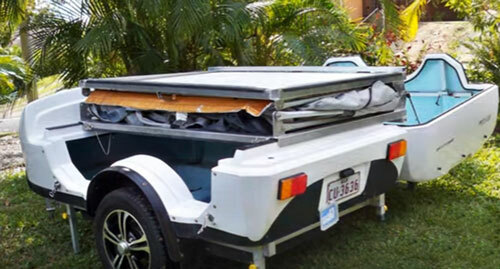 The standard rack mounted on the top of the lid can carry extra luggage, but frankly given the fact that it is Australian design, the rack is “optimized” for currying the surfing boards! Almost done: Visible sleeping area supported by trailer's lid and partially by trailers' main body. 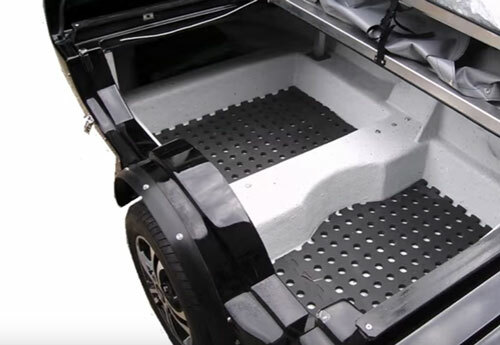 Evo-Pod with external room: On the left (Dressing room) visible floor and "masking panel" as well as "Molded-fiberglass" step (part of he trailer's body) facilitating access to and from the bed. 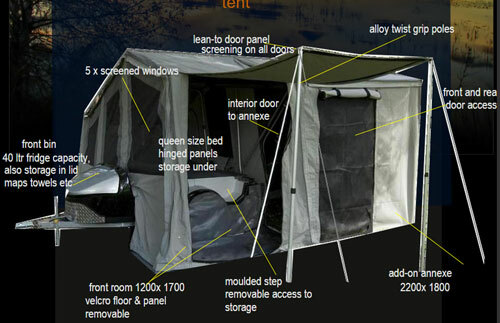 The tent and bed hardware can be easily removed (it’s a matter of some 30-seconds job). 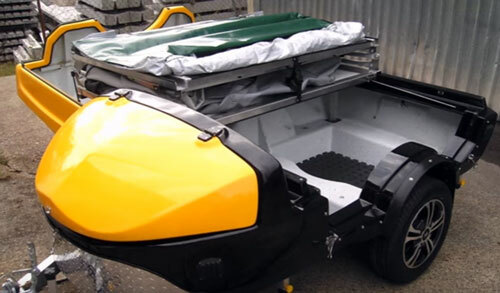 This way the camper is converter to cargo trailer with the capacity to carry up to 100kg (220 lbs)of load. 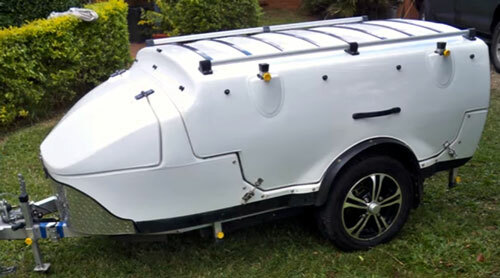 Summarizing: Evo-Pod is an interesting camper designed for towing by motorcycles, ATVs and small cars. Convinced of future success the company also planed the “improved” version called Evo-Pod GT. Unfortunately it seems like the project went nowhere, although it may be the false assumption. Nevertheless – this presentation is an opportunity to see what’s happening across the world…. And believe me, you can find a lot of interesting ideas and stories including successful ones!